Your English level. If you are from a English speaking countries you will be quite welcomed, the agencies in China will thrive to you lots of interested families, also if your English is in fluent level, you do not need to worry about finding a host family at all. Work schedule. You will find the host families are not clearly aware of your work time, in the worst case the family hope you can stay with the children as long as you can, so making a time table is quite important for you and in most cases your agency will help you to make one. The arbitrager between you and the family could only be the agency! Chinese family cannot hire a foreigner directly by law so the agency make the au pair program more like to be a Culture exchange program, so the labor department does not help if there is any confusing between you and your family. So find a good agency is quite important! The family could be super rich! 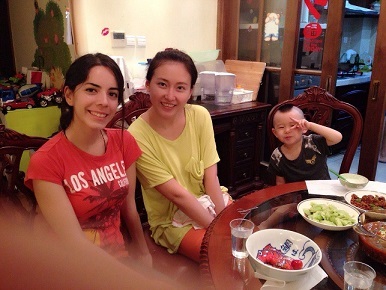 Nowadays in China the host families are almost wealthy enough to pay the agency to hire an au pair. So do not be astonished if you find your host family is quite rich and try to respect their way on money spending even in your mind they are wasting the money at all. Curfew! That could really happen, since some families are not wise enough they hope you can “safely” stay home, but now as an agency we find nearly all families will accept the truth that their au pair is a human being from more opened western culture. And if you plan to stay out please let the family know, we suggest you send a text after the call. Tough Mandarin. Yes, the agency or the family will arrange the AU Pair to study Mandarin (Chinese), but some AU Pairs consider it as a burden and are not willing to take time to study. But if you are interested of Chinese studying and the main purpose for you au pairing to China is Mandarin study. Then do not hesitate to start your au pair journey to China! The contracts. Normally you will sign 2 contracts, one is with the family one is with the agency. Read your contracts all thru before signing it and make sure all your benefits as an AU Pair in China will be listed on the contacts. The medical care. Normally the agency/family will ensure you will accidental insurance. So that means for a normal case you may need to pay, but do not worry if you just catch a cold that will be quite cheap to get treated in China. Also if you think you can insure yourself very well by your insurance in your home country (some of them may cover your oversea trip), you can negotiate with your agency to reimburse you on your insurance pay. Sometimes you may need to rematch with a family, in this time the agency will find you a place to stay. But make sure you are aware of their rematch policy. Of course you may need to prepare the worst case, buy yourself a ticket to back home. But as a big girl/boy, you are prepared of everything, isn’t it? This Blog is published by aupairinchina.org. The article(s) and Images(s) are ONLY for the aupairinchina site.